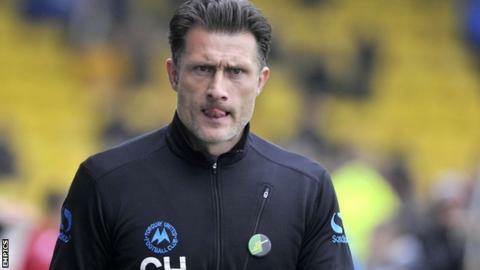 Torquay United manager Chris Hargreaves has insisted his side can still stay up despite being 10 points adrift of safety with five games remaining. The Gulls are bottom of League Two with just two wins from their last 13 games. Speaking after Saturday's 1-0 defeat by title-chasing Scunthorpe, Hargreaves told BBC Radio Devon: "Of course we can get out of this - five wins. "I'll keep fighting, the players will keep fighting and we know that the fans are behind us." Torquay will draw hope from the fact that three of their remaining five matches come against sides also currently in the bottom five. However, Hargreaves' side could be relegated as early as this weekend if they lose away to 21st-placed Bristol Rovers and other results go against them. Torquay have the worst goal difference in the division (minus 24) and have conceded the joint-highest number of goals (59). The club have been in League Two since securing promotion in May 2009, when Hargreaves himself, then club captain, scored in a 2-0 victory over Cambridge United in the Conference Premier play-off final at Wembley. The former Oxford, Hereford and Plymouth midfielder was appointed Gulls manager in January after previously working as a coach at Bournemouth. Since Hargreaves' appointment, Torquay have won 25% of their games, but Saturday's loss was the team's fourth consecutive defeat. "The players were excellent in the first half against Scunthorpe," Hargreaves added. "They've got to reproduce that again. "[We need] the same tempo and the same performance. I was really pleased to see it. "For the whole game, I thought we were the dominant team, but sometimes you don't get the breaks."